You may have sent a gift in the past but this beautiful gift is one like never before. Don't you want your gift to convey the most precise message? Send this gourmet gift tray now! 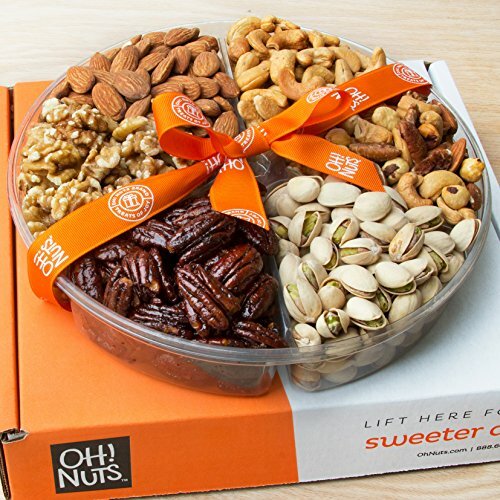 - This nut gift tray is shipped with frustration free packaging making it even easier to enjoy this delicious item. - The nuts in this tray have all been hand picked and freshly roasted in our state of art facility, so that the recipient of these nuts receive only the very best . - With the option of gift wrap and personal greeting card it really makes the ultimate gift. - Great for any time you want to serve something tasty and classy be it for parties business meetings or any other occasion . -Our goal is to bring you the very best in quality and design. OUR PROMISE TO YOU IS A 100% SATISFACTION GUARANTEED. ABSOLUTLEY NO QUESTIONS ASKED!!! The only complaint we have had for this item is that they get eaten much faster than expected. One can never order enough of these deliciously roasted nuts. Click Add to Cart at the top of the page and get yours now. A generous Amount Of Delicious Nuts make Greatest Gift Basket For Any Occasion, Thanksgiving, Christmas, Holidays. Roasted Salted Cashews, Pistachios & Mixed Nuts, Raw Walnuts, Honey Pecans & Smoked Almonds. Freshly Roasted in Small Batches to ensure the most delicious flavor and texture. Ok Kosher Certified. Dimensions Width 10 inches Depth 1 Inch. Approximate weight 1 Pound. If you have any questions about this product by Oh! Nuts®, contact us by completing and submitting the form below. If you are looking for a specif part number, please include it with your message. Roth Kase Grand Cru Gruyere Shredded Cheese, 5 Pound -- 4 per case. Grand Cru Petite Swiss Wheel Cheese, 12 Pound -- each. Roth Kase Grand Cru Reserve Gruyere Wheel Cheese, 18 Pound -- each. Sartori Reserve Balsamic Bellavitano Cheese, 5 Pound -- 4 per case.